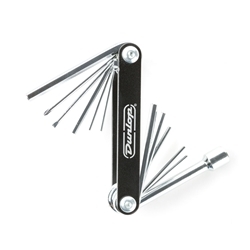 The Dunlop Multi-Tool is a screwdriver, socket wrench, and hex key all in one, featuring numerous attachments to help you keep your instrument in tip-top shape. Whether you need to adjust your truss rod, remove your pickguard, or adjust your string action and pickup height, this gig bag necessity will accommodate almost any instrument. Features 9 hex key attachments (six metric, 3 standard), a Philips #1 screwdriver attachment, a 2.5mm flathead attachment, and an 8mm socket wrench attachment.